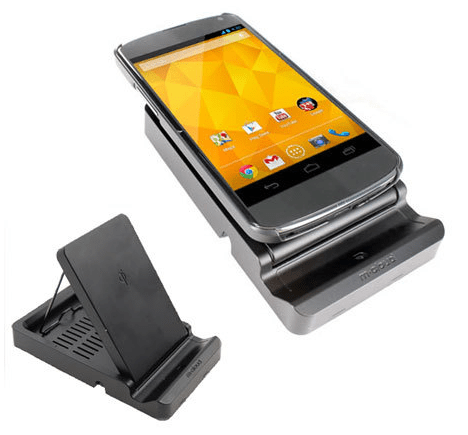 This is a wireless charging pad, as well as a stand for both your Qi compatible phone, and any other device that may be compatible. Moreover, as a stand, this works perfectly not just for phones, but also for tablets. The pad itself is a sturdy built, and has a solid paste. A small mechanical clip means that you can adjust it at a tilt. This means that you can set your phone at an optimum angle. As mentioned above, this can also serve as a stand to most tablets, and anything else that you would like to tilt at that angle. The curved pocket at the bottom keeps your device still and prevents it from slipping. The charger works well on the Nexus 4 I have been trying. Once in place, the LED will blink green, and go solid once charged, before going out. When the Nexus does not sit on this, or no device is there, there is no LED, which is a fairly good feature. The blinking light maybe a distraction at times, but it isn’t too bright. Charging time was found to be about 2-3 hours, typically 2 and a half hours. I have a case on top of my Nexus 4. Will it charge? That is something that can only be answered depending on the case. It will work for most thin/barely there kind of cases, but the thicker you go, the harder it will be to charge. The stand comes with an adaptor which gives out 19V at 600mA. This means that compared to general chargers, it has a higher consumption than most chargers, but it works wirelessly! So what is this wireless malarkey anyway? I can be boring and explain the whole thing to you, but it works on a similar principle to how your toothbrush charges. In the case of this particular charging pad, you just place your phone on top of it, and let it charge. Almost a bit too good to be true! Nexus 4? Any other phone? There is actually a long list of phones that can be charged using these chargers. Any phone that is compatible with the Qi charging standard should charge. You can check with your manufacturer, or use the power of Google. Some phones may not have the ability built in, but you can buy a case that converts it into a wireless charged device. Oh I like it, how do I get it? It charges by magic, takes very little time to do it, acts as a stand, and doesn’t look too bad. Hey, it also comes in white as well. Definitely one of our favourite gadgets!